With the commissioning of the first phase of Chandni Chowk redevelopment, the Shahjahanabad Redevelopment Corporation (SRDC) has decided to lay underground the hanging wires of electricity and construct footpaths on both sides of roads. The Municipal Corporation of Delhi (MCD) today sought the intervention of the National Human Rights Commission on the issue of contaminated drinking water allegedly being supplied by the Delhi Jal Board (DJB) to the residents of the city. Beginning tomorrow, commuters will be able to book tickets at the Airport Metro express Line with their debit/credit card as well. In a bizarre incident of fire in an Alto car at road number 51 between Azadpur and Mukundpur in northwest district, Pradeep Arora (30), a salesman in a private company, was found charred to death this morning. Fresh trials will be conducted for admission under the ECA (extracurricular) category at Hindu College in Delhi University. The capital's residents, long used to shirking municipal sweepers and litter-piled streets, have been in for a surprise as thousands of volunteers, ranging from students to housewives and even businessmen, armed with long brooms have trooped through various neighbourhoods with a mission to clean the city. Prof PK Basu, who was recently sacked from Jamia Millia Islamia after allegedly making communal and sectarian remarks, is suddenly getting popular among alumni students. Minister of state for health AK Walia has threatened that adulteration in food items will invite strict action against defaulters. He has instructed the prevention of food adulteration (PFA) department to book the adulterators. A Delhi court has awarded around Rs 9 lakh compensation to the family of a maid who was killed in a motor cycle accident here in 2008. A drug peddler, caught selling charas, has been sentenced to 10 years in jail along with a fine of Rs 1 lakh by a city court. A 36-year-old man was arrested here for allegedly stocking and selling denim with fake logos of an international brand. Articles worth Rs 20 lakh were seized from him. A man was arrested in south-east Delhi for allegedly cheating a person in a bank, the police said today. A CBI court here today convicted three people for the 2006 murder of university professor Kavita Chaudhary in Uttar Pradesh. Two persons, Pradeep (21) and Kamal Kishore (19) were arrested for allegedly murdering a businessman, Narender Narang (44). The police said that the accused robbed Rs 50,000 from his residence after killing him. Chief Secretary of the Delhi Government, P. K. Tripathi said that the SRDC has taken up the project in Chandni Chowk and Jama Masjid peripheries. The work includes streetlights, signage, public utilities and upgradation of essential community facilities. The other projects which are being taken up in three phases include the redevelopment of the surroundings of Jama Masjid, conservation of Fatehpuri Mosque, Ghalib ki Haveli, identifying his famous Maikhana, cultural mapping and publication of the maps of Shahjahanabad. Besides, introduction of traditional cultural activities such as crafts, bazaars, festivals, fairs, kite flying, etc are also part of redevelopment. Efforts will also be made to revive the central ambience of Shahjahanabad. A tender notice for the first project of SRDC has been invited and work will begin in the first week of December, the Chief Secretary said. He said that Shahjahanabad is virtually a fire trap with the dangerous tangle of wires hanging from electricity poles. A small spark is enough to trigger a blaze in the congested locality. The dangling wires in the city are not only an eyesore, but also a hazard during the rains. A live wire touching a soaked wall or puddle could lead to electrocution. Now the deadly maze of wires has to go underground. The Chief Secretary said that BSES will soon begin work on a project to get rid of overhead electricity wires that hang at a dangerously low height in Chandni Chowk, Daryaganj areas and all parts of the walled city. The first phase of the project will cover most of the affected roads of Chandni Chowk and Daryaganj. In Chandni Chowk, roads like Church Mission Road, Esplanade Road, H.C.Sen Road, Naya Bazar, Khari Bawali, Nai Sarak and Dariba will be covered while in Daryaganj, the overhead system of electrical wires will go underground at Jama Masjid Urdu Bazar Marg and Matia Mahal Road. In Daryaganj division, two transformers would be converted into package substation while 10 km low-tension cables, 400 m high-tension cables, 34 feeder pillars and 22 km service lines will be installed. The project amounting to Rs 13.23 crore will be funded and monitored by the (SRDC. The civic body wrote a letter to the NHRC chairman, KG Balakrishnan, to fix responsibility on the contaminated water supplied by the DJB. The MCD and DJB jointly collect samples for chlorination of water and send reports every week to each other. In samples checked for chlorination, around 10 per cent of water samples have been reported to be without chlorination which means that some area of the city is receiving contaminated water. Out of the 1,219 tubewells, only 629 are functioning with chlorinators while 105 are without chlorinators and 485 tubewells do not have chlorinators at all. "We have requested to the chairman to fix responsibility in unchecked contaminated water supply by the DJB despite repeated reminders by the MCD. We have drawn his attention towards the unhealthy water supply to as many as half of national Capital population," said VK Monga, chairman of the health committee. Reliance Infrastructure, the concessionaire of the Delhi Airport Metro Express, has installed debit and credit card machines at the six Metro stations that will be operational from tomorrow. Two machines are installed at each station. All the ticket counters will accept Visa, Master and Maestro debit and credit cards of any bank to buy travel tokens. The machines will soon accept American Express cards also for buying train tokens or recharging smart cards. Commuters can now purchase train tokens, monthly passes and top up their Stored Value Cards (SVC) at the counters with their debit/credit card. This will provide them freedom from carrying currency and give them benefits of credit card loyalty programmes. Anil P Gupta, president, Reliance Infrastructure, said, "Reliance Airport Metro Express works for the convenience of commuters. Introduction of debit/credit card machines at the stations is a step in this direction. Commuters can now save themselves from the hassles of change." The minimum transaction amount is Rs 100 and the maximum value of SVC is Rs 1,000 per card per transaction. For other products, the maximum amount accepted per transaction will be Rs 3,000. "The ticket booking service will be available online soon and commuters may top up their travel cards with the use of debit/credit card," Gupta added. The body of the salesman, who is a resident of Babarpur, was recovered from the front seat of the car. His brother, Surinder, managed to identify him by recognizing a steel rod that was inserted in one of his hands after an operation. A police official gave an account of an eyewitness. "The eyewitness said that the car caught fire from behind. He tried opening a door, but could not. When he threw a stone at the car, its alarm went off. The indicator lights of the car and wipers turned on immediately. The witness then went away from the car," said the official. The official added that a mechanic would check the car to discover the cause of the fire. The police has also called engineers from the Maruti company to check for possible malfunction in the vehicle. The petrol car was brand-new. Pradeep's body was identified by his brother Surinder. "Surinder recognized the rod inserted in Pradeep's hand, which was probably due to an operation," said a police official. The official said that his body has been taken to the Babu Jagjivan Ram Hospital for a postmortem. Ram Nawal Sharma, head officer of Jahangirpuri Fire Station, said that he received a call regarding the burning vehicle at 11.40 am today. "When we reached the spot at 11.45 am, the car was completely on fire. The windows were closed and the seats were completely burnt. The victim was sitting in the co-driver's seat," he said. Aman Juneja, an eyewitness, said that the fire started from the rear of the vehicle. "I along with my cousin was driving to my college in Rohini. We saw the trunk of the Alto had caught fire. The car had tinted windows and when I closely looked at it, I did not see anyone inside. We called the fire station immediately," he said. "When we reached the spot, the car's wipers and lights turned on. We didn't hear anyone screaming," added Dharmesh Raj, who is Juneja's cousin. Another eyewitness said that he saw two more persons present inside the car. "I saw three people sitting inside the Alto, which was moving while it was on fire," he said. 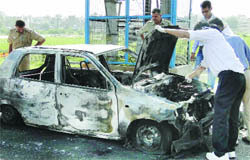 Sources said that the silver-coloured car caught fire due to some malfunction in the air conditioner. "Pradeep is a sales manager with Airtel. There is no possibility that someone else was inside the car. His body was on the co-driver's seat as he was probably trying to escape," said a source. The auditions for extracurricular activities and trials for basketball, cricket, lawn tennis and swimming were conducted by the college between June 28 and July 9 for candidates seeking admission on the basis of their talents. Later, the college had put its ECA and sports admissions on hold following a series of complaints questioning the fairness of trials. Three students had filed a writ petition challenging the fairness of the trials. "As per the directive of the Delhi High Court, the fresh trials of the candidates who had already applied for admission under ECA category in various undergraduate courses of Hindu College shall be held," read an official statement issued by the university. While the preliminaries will take place on September 28 and 29, the final round of auditions will be held on September 30. All the auditions will take place at the Delhi University's conference centre. The auditions will begin at 10 am each day though the candidates are required to report by 9.30 am at the venue. On September 28, auditions for dance, debate, declamation, fine arts, photography, creative writing and quizzing will take place. On September 29, auditions for music (instrumental and vocal) and dramatics will be held. No accessories like recorded music, tape recorder, CD player, musical instruments, papers or colours will be provided by the university. The candidates are required to arrange their own accessories. The candidates must carry the original and relevant certificates of their extracurricular activities. The list of shortlisted candidates selected for the finals will be displayed at the venue after completion of the preliminaries. The list will also be displayed on the university website. Interestingly, the college's governing body had abolished the sports and ECA category before admissions began this year. According to the college, several complaints last year had led the governing body to take such a decision. However, it was revoked on 'popular demand'. Over 150,000 volunteers, who came to the city yesterday, started their drive from Rajghat. They will end their drive on Thursday evening, cleaning almost all parts of the city. Dera Sacha Sauda, a social and spiritual organisation in Sirsa, Haryana, that participates in all kind of welfare activities has organised this activity. It has provided the volunteers with several equipments to clean the city. Explaining the concept behind this unique drive, Varun Wadhwa, a financier and a volunteer, told IANS: "We are cleaning the country so that citizens understand their prerogative in keeping the city clean and do not litter around." The volunteers, both men and women and many wearing uniforms proclaiming a "Green Force", have come from different parts of the country like Haryana, Rajasthan and Punjab. Most of them are surprisingly, students, some even postgraduates, as well as financiers, businessman, traders, teachers and social workers. They started the drive with Delhi as the first city and plan to take it ahead. "The head of our Dera Sachha Sauda Gurmeet Ram Rahim Singh Insan will decide the next place. It could be Faridabad, Gurgaon or Noida. The main objective is to clean the whole country," said Phiray Singh Insan, a member of the organisation. "Everybody whether old or young has participated in the drive which will end today (Thursday). This was a two day drive in which we have cleaned more than 60 per cent of Delhi...I am sure we will be able to clean up the entire city by evening," he added. In order to cover the whole city, the volunteers were divided into 13 teams. Each team worked in different zones across Delhi. The teams were further divided into different wards in a particular zone, officials said. Besides, the team sought help from the Municipal Corporation of Delhi (MCD) in its mission. Basu's former students alleged that the professor's remarks were "misinterpreted" and he "deserves justice". He was the victim of internal politics of the varsity. They started a signing campaign to build support for Prof Basu and 128 former students have signed a petition in his support. They have addressed a petition to the vice-chancellor declaring that, "We, the ex-students of CMS, unanimously dismiss and condemn the idea that Prof PK Basu was a communal person. We were not present inside the class room to know what exactly happened that day. But, we, belonging to batches spanning across approximately a decade, come together and declare that not once did we witness any differentiation being made on the basis of religion by our highly respected teacher. We fear that if a secular person like Prof Basu is declared communal, it will tarnish the secular image of Jamia Millia Islamia itself." The alumni has alleged earlier that when the incident occurred only 38 out of 70 first year students had signed the letter demanding the sacking of Prof Basu while the rest were not in favour of it. An alumnus of Jamia, Manish Kumar, said, "I passed out of Jamia just last year and Prof Basu was one of my teachers. I recall my period with him with fond memories. He was a very fair man. I cannot believe they accuse him of making communal comments. This is unbelievable. I think there must be some internal politics here because Prof Basu has always been a very secular person." Earlier, Jamia had slammed a libel case against Prof Basu after sacking him. Basu, who was a guest lecturer, was caught making communal and sectarian remarks in a class at Jamia on September 9. Following the blast at the Delhi High Court, Basu had allegedly said, "This is a minority university, you (students) are all idiots, you are all illiterates, why am I wasting my time here." The students had then decided to boycott his classes and wrote a letter to honorary director Prof UM Amin and asked him to take necessary action against Basu. Officials of the department lifted 289 samples during a drive launched from August 5 to September 21. Of them, eight samples were declared unsafe. Cases have been registered in respect of these samples. Another 10 samples were found substandard and eight misbranded. The samples of rice were found infected by insects while those of black pepper were fungus-infected. Boondi laddoo, Karachi halwa and coconut burfi were found to be having more synthetic colour than permitted. The samples of cheese were found to be having less fat than the limit allowed whereas samples of full cream milk and toned milk were not up to the mark. The samples of butter and mustard oil were not pure. Walia instructed the department to go all out to lift samples in view of the forthcoming festive seasons. It has also been told to take rounds of weekly bazaars and act against loose spices being sold at cheap rates. It has also been told to keep an eye on imported fruits. Upgrade the existing laboratory and set up another advanced lab, he said. In its order, a Motor Accident Claims Tribunal held the motorcycle rider guilty under the Motor Vehicles Act and ordered the insurance company to pay the maid's family the compensation amount. Presiding officer of the tribunal Poonam Choudhary awarded Rs 7,96,098, apart from over Rs 1 lakh interest, to the family members of Maya Devi, who was killed in the accident. The court in its September 13 order directed the insurance company to pay the sum within a month along with an interest of 7.5 per cent per annum from the date when the case was filed in March 2008. 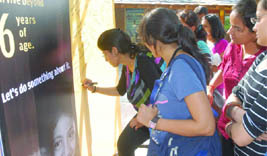 The interest would add up to over Rs 1 lakh. Maya Devi died a month after she suffered serious injuries in a road accident on February 25, 2008. A motor cycle hit her when she was crossing the road near Udyan Marg. "I sentence convict Sikander to rigorous imprisonment for 10 years and a fine of Rs 1 lakh," Additional Sessions Judge Anju Bajaj Chandna said, sentencing the drug peddler. Sikander, 29, a resident of Sadar Bazar in north Delhi, was arrested on July 4, 2009, from Kashmere Gate Inter-State Bus Terminus following a tip-off that he would be coming there to sell charas. A search of his bag led to the recovery of 1.5 kg of the narcotic, which was found to be charas after forensic test. Mohd Shokeen was apprehended yesterday on a complaint from the company which claimed that he was selling denim with fake logos in his Gandhi Nagar shop. A total of 1,035 denim trousers and 200 duplicate stickers bearing deceptively similar trade mark and logo of complainant company were seized. The accused has been identified as Mohd Arif. He was arrested yesterday following a complaint by Ravinder Rai who had gone to Punjab National Bank in Ashram Chowk to deposit money. "Two boys were standing in the queue ahead him. One of them, later identified as Arif, approached the complainant and requested that he had Rs 1 lakh with him and he wanted to send Rs 10,000 to his village by depositing the same in his account in PNB. He asked Rai to keep his packet of cash and asked for Rs 10,000. He also showed a note of Rs 500 by removing it from the packet wrapped in his handkerchief. He assured Rai that he will give him Rs 20,000 after depositing Rs 10,000 taken from Rai in his account," said Ajay Choudhury, additional commissioner of police (south-east). Rai handed over his Rs 10,000 to Arif. The accused asked him to wait for him to return from bank with another boy who was accompanying Arif. "After some time, when Arif did not return, his associate went on the pretext of searching for him. After some time, when both did not return, complainant doubted the situation and checked the handkerchief containing the packet and found that it contained one note of Rs 500 on the top and beneath it there were white papers which were given the shape of notes," Choudhury added. Rai went to the bank to search for cheaters and caught hold of one of them later identified as Arif. A notice was also issued to key witness and former state irrigation minister Merajuddin Ahmed for turning hostile during the trial, said senior public prosecutor Ejaz Khan. The court, rejecting the Central Bureau of Investigation (CBI) plea, did not accept the closure report for dropping the probe against two former state ministers and former vice-chancellor of Chaudhary Charan Singh University (CCSU) in Meerut where Kavita Chaudhary was a professor. Special CBI Judge A.K. Singh convicted Ravinder and Sultan for murder, abduction, conspiracy, extortion and causing disappearance of evidence. Yogesh was convicted for extortion and criminal conspiracy. Ashok, a fourth accused, was acquitted. "Another accused, Ravinder Pradhan, died in the jail during trial," said the senior public prosecutor. The quantum of sentence for the convicts will be pronounced later. Ahmed had to resign as minister after his name figured in the murder of the professor, who was abducted by five assailants on October 23, 2006, from Garhmukteshwar. The court rejected the CBI's report to close the probe against the then basic education minister Kiran Pal Singh, the then minister of state for food processing Babu Lal and former CCSU vice-chancellor R.P. Singh. The CBI filed a charge sheet March 23, 2007. The agency presented 33 witnesses, of whom three, including Ahmed, turned hostile. On August 29, the police found the decaying body of Narang on bed at his residence in Kirti Nagar. During the investigation, the police discovered that Narang had sexual relationships with men. “On August 26, Pradeep and Kamal reached the Shastri Nagar godown of Narang and from there they arrived at his house. After eating food, they got engaged in illicit acts and soon the duo tied his feet with a nylon cord. Kumar killed him by choking him with a wire,” said V. Renganathan, Additional Commissioner of Police, West District.